Questo è uno dei miei tutorial preferiti!!! Fantastico!!! 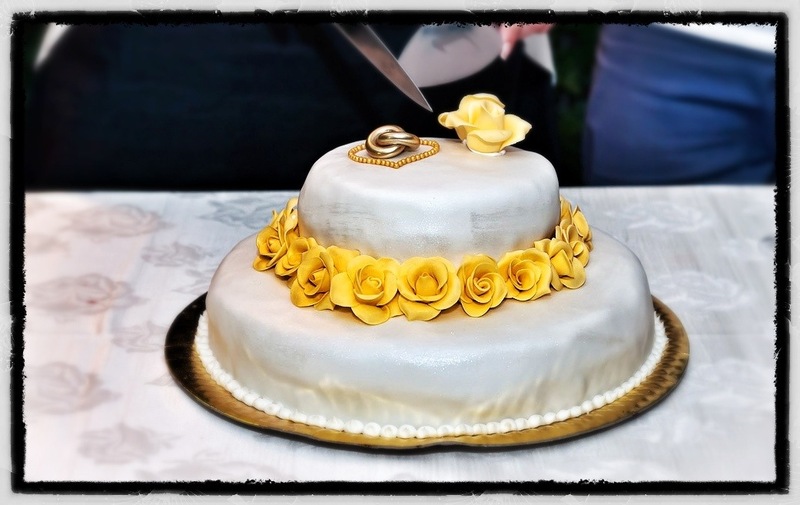 A wedding cake is essentially just a really big layer cake, and making one from scratch can be fun as long as you plan ahead, are organized, and have all the right equipment on hand. Keep in mind that this cake, if decorated differently, would be great for any big celebration, such as a birthday, anniversary, or anytime party. Before tying on your apron, it’s good to know what you’re in for, so here’s the rundown. The cake comprises three cake tiers: a 12-inch bottom tier, a 9-inch middle tier, and a 6-inch top tier. Each tier is made of three layers of cake and two layers of filling (mix and match flavors, if you so please). 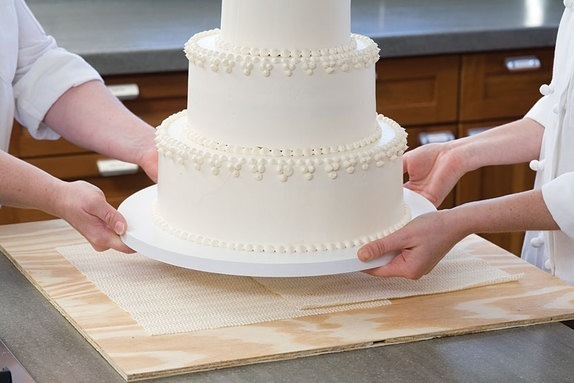 After baking, assembling, and frosting each tier separately, the tiers are stacked on top of each other; evenly spaced wooden dowels placed within each tier ensures overall structural integrity and helps prevent the cake from collapsing upon itself. After stacking comes the fun part: decorating! And even more fun after that: transporting. Before you know it, it’ll be time for merriment, a toast to the new couple, and sweet, sweet cake. With proper time and preparation, this baking behemoth will be well worth the effort. This project will take you roughly 12 hours of kitchen time (though much of the work can be done ahead); it is essential that you have a roomy refrigerator (or an extra one) and a lot of freezer space. You’ll need one 12-inch, one 9-inch, and one 6-inch cake pan. A 4.5-quart capacity mixer works fine; you could use a hand-held mixer but it will be quite laborious. You’ll need at least 5 of each size, but having more on hand can be helpful. You’ll use these for unmolding the cakes from the cake pans, storing the cake layers, and assembling and icing the tiers. You will need this when making the buttercream. This specialty item is essential to support a multitiered cake. It is available in a variety of styles and materials including heavy-duty plastic, Formica, ¼-inch-thick foil-wrapped cardboard, and sterling silver. 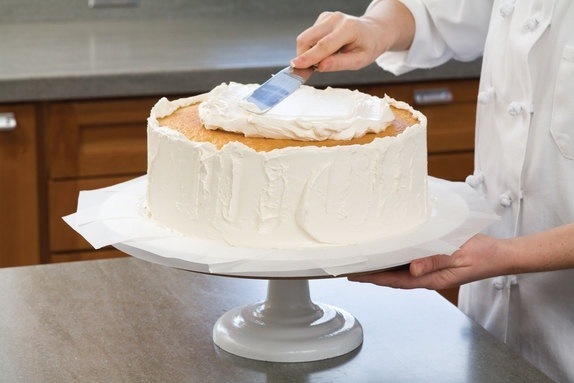 You’ll use the tape to adhere the cake (on its cardboard round) to the cake base. You’ll need 1 yard of ¼-inch-thick wooden dowel rod (available at most hardware or craft stores). It is helpful to have multiple flat and offset icing spatulas of various sizes for icing and assembling the cake. This will keep the cakes from slipping while you’re icing them and keep them stable when they are transported. This is essential for icing the cake and getting the sides smooth. 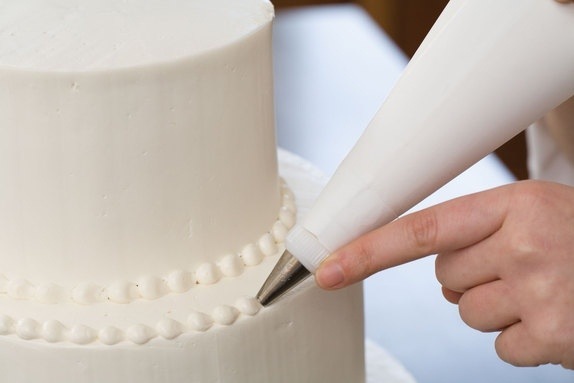 If you want to experiment with a variety of cake designs, you will want other sizes and types of tips; to make switching the tips easy (without having to empty the pastry bag), buy a coupler. You’ll need a 2-foot-square piece of ¼-inch-thick plywood. You will use this for transporting the finished cake to its final destination. 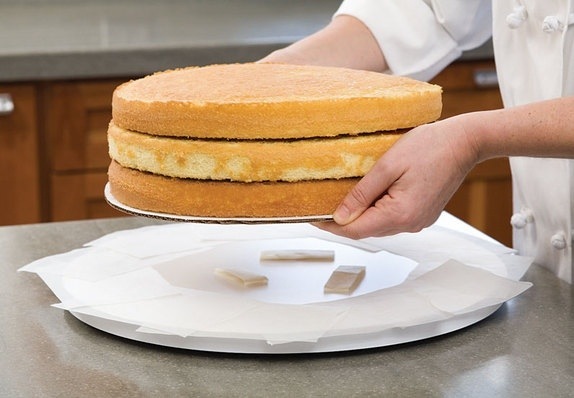 Slide a 12-inch cake layer onto a 12-inch cardboard round and spread 2 cups of the filling over the cake, leaving a ½-inch border at the edge. The bottom tier will remain on this cardboard round throughout the entire cake-building process. Repeat with another 12-inch cake layer and 2 cups more filling (if using two filling flavors, use the second flavor here). 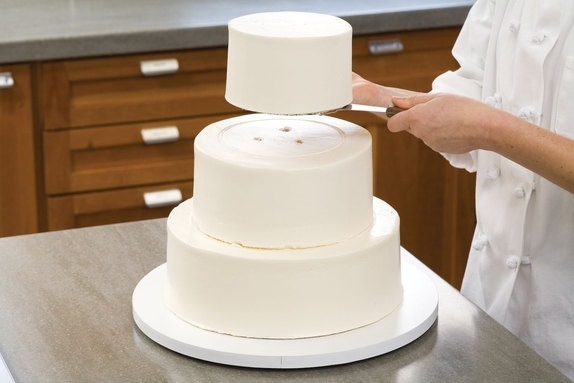 Be sure to use a cardboard round to help move the cake layers around. Put the worst-looking layer in the middle of the cake and leave the prettiest, flattest layer for the top. 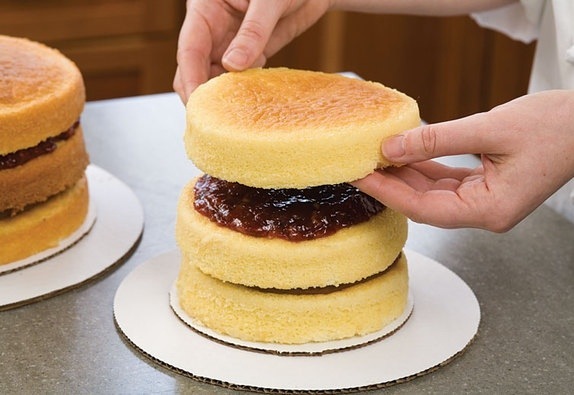 Set the bottom tier aside and build the middle tier on a 9-inch cardboard round using 2 cups more filling (1 cup of filling between the layers). On a 6-inch cardboard round, build the top tier using the remaining 1 cup filling (½ cup of filling between the layers). To make it easy to move these tiers around (especially after they’re iced), we support them with larger cardboard rounds lined with a piece of nonslip shelf liner. Line the edges of a 14-inch round cake base with small shingled pieces of parchment. Place several loops of masking tape in the center of the base and gently lay the bottom tier, supported by its 12-inch cardboard round, onto the center of the base. You will frost the bottom tier right on the cake base. 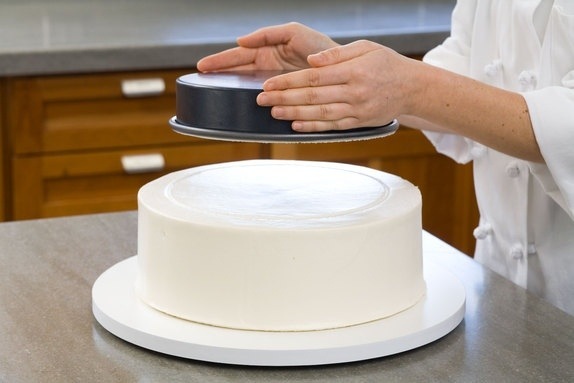 Using a revolving cake stand lined with nonslip shelf liner, ice the bottom, middle, and top tiers separately. Spread a thick layer of buttercream, between ¼ and ½ inch thick, over the sides of the cake using a back and forth motion. Then drop a mound of buttercream onto the top of the cake and gently spread it out to a smooth, even layer. Continue to smooth out the buttercream on the sides of the cake until it looks even and clean. 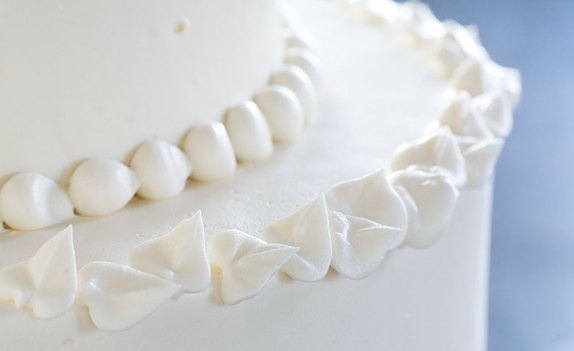 The excess buttercream will naturally form a lip around the top edge. 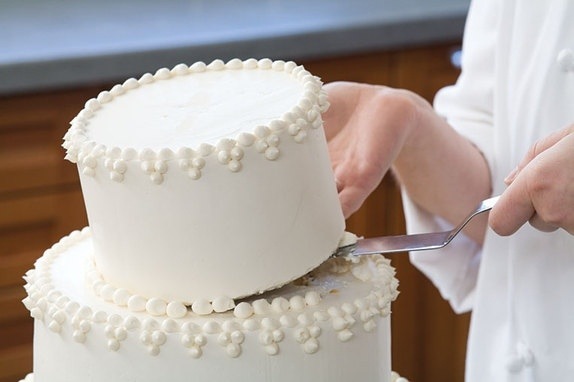 To remove this excess buttercream, simply swipe it across the top of the cake with a clean spatula. 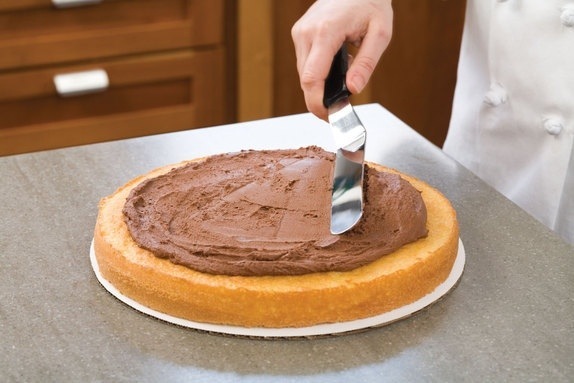 Lightly press an inverted 9-inch cake pan or cardboard round in the center of the bottom tier to make an outline. 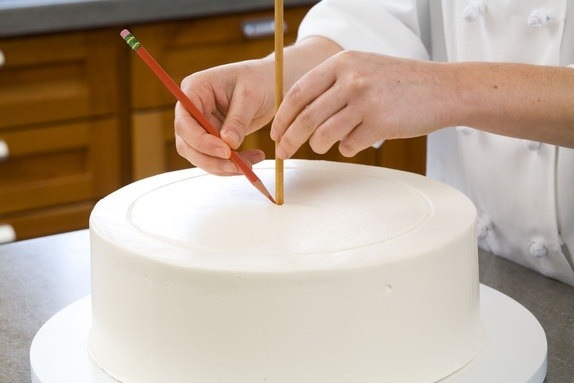 Insert a dowel into the very center of the bottom tier and mark the height of the frosting on the dowel with a pencil. 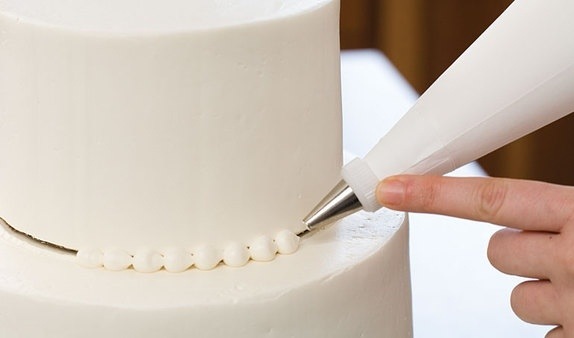 Remove the dowel from the cake and cut 5 dowels to this length with a serrated knife or small saw. Place one of the trimmed dowels in the center of the bottom tier and insert the other 4 dowels around it, spacing them evenly within the outline. The dowels should be the same height as the frosting, or just a little shorter. If the dowels are too tall, remove them and trim as needed. 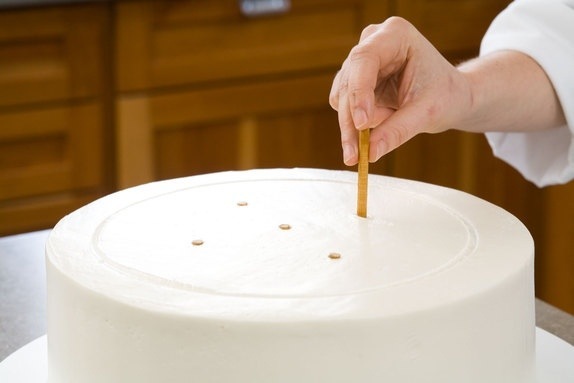 The dowels will help prevent the upper tiers of cake from crushing the cake underneath. Using an inverted 6-inch round cake pan or cardboard round, mark an outline in the center of the middle tier, then measure 3 more dowels and space them evenly within the outline. 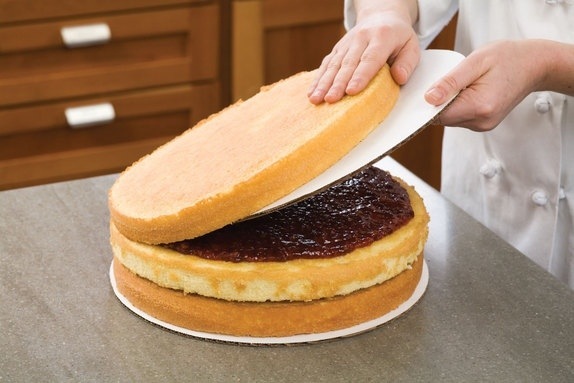 Using both a metal spatula and your hand, gently lay the middle cake tier, supported by its 9-inch cardboard round, in the center of the bottom tier using the outline as a guide. (The cardboard round will remain underneath the tier, for support, until serving time.) Lay the back of the tier down first, then remove your hand, and slowly lower the tier down using just the spatula. 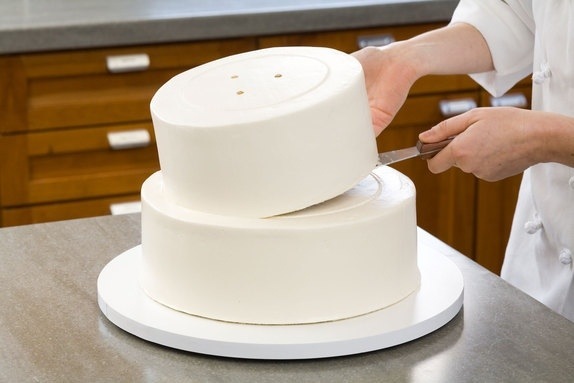 Gently lay the top cake tier, supported by its 6-inch cardboard round, in the center of the middle tier using the outline as a guide. 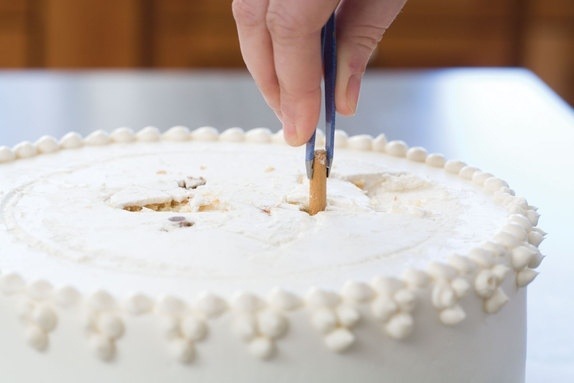 Before you start decorating, choose the best-looking side of the cake to be the “front.” Start decorating at the “back” of the cake and work your way around—this way, all the start and stop points from piping will be hidden at the back. Repeat the running pearl edge around the top edge of each tier. Use your finger to help guide the tip and keep it steady as you pipe. Take your time here and make the pearls as even as possible. Using a 3⁄16-inch round tip, pipe a small trio of dots along the top edge of each tier, leaving a pearl’s width between each trio. To make these dots, pipe a small amount of buttercream, then stop piping and pull the bag straight away. Hold the bag perpendicular to the cake. 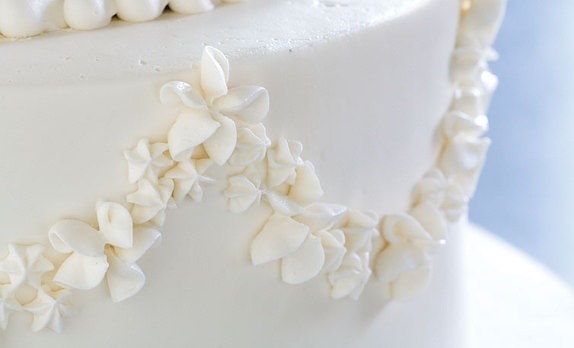 You can either do a single row of leaves at an angle (as shown) or let the leaves drape straight down over the side of the cake. Any leaf tip will work here. You will need to use a flower or star tip to make the flowers, and there are lots of different varieties to choose from. We like garlands made with two or three different styles and sizes of flowers. Before you start, divide the cake into quarters and mark out how many sweeps will fit within each quarter. 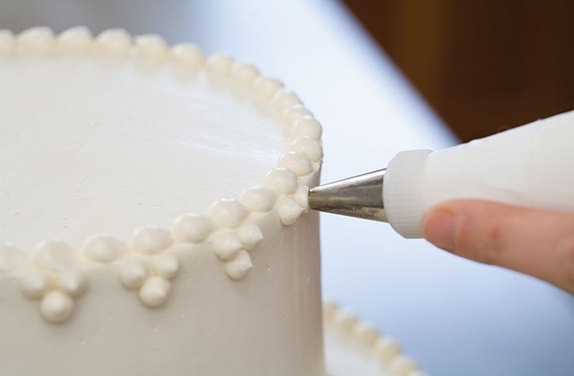 Using a 1⁄16-inch round pastry tip, start with the sides first and pipe a scalloped edge of dots around the side of the cake; for an even scalloped pattern around the cake, divide the cake into quarters and mark out how many scallops will fit within each quarter. 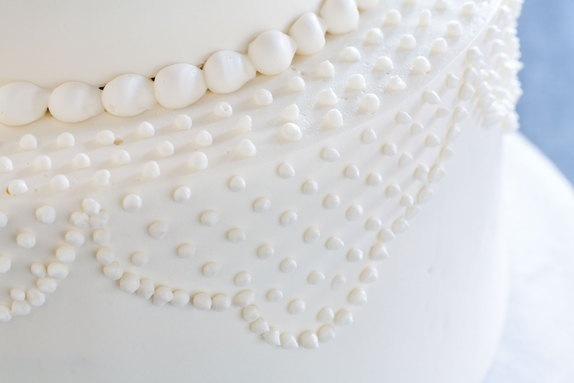 After making the scalloped edge, pipe offset rows of dots above the scalloped edge on the side of the cake and onto the top of the cake tier. 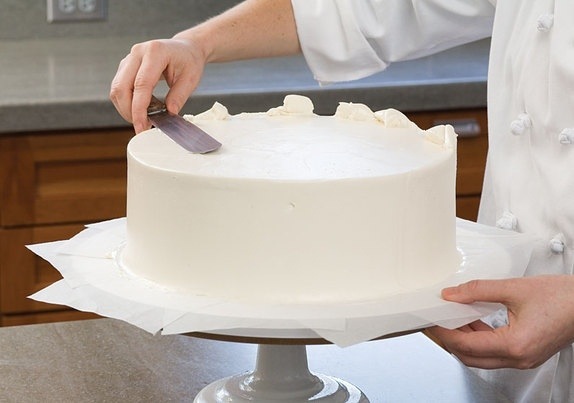 Once the cake is stacked and decorated, it can be tricky to move around; we find it helpful to use a 24-inch-square piece of plywood lined with a piece of nonslip shelf liner. If you have to transport the cake by car, make sure that the plywood base fits in your car. For tricky transport (or a long car ride), you may want to consider cutting open a large clean cardboard box, then taping it closed around the cake and attaching it firmly to the plywood. When you are ready to serve the cake, carefully transport it back to the kitchen. Don’t attempt to cut the cake in front of your guests, because it can get very messy. 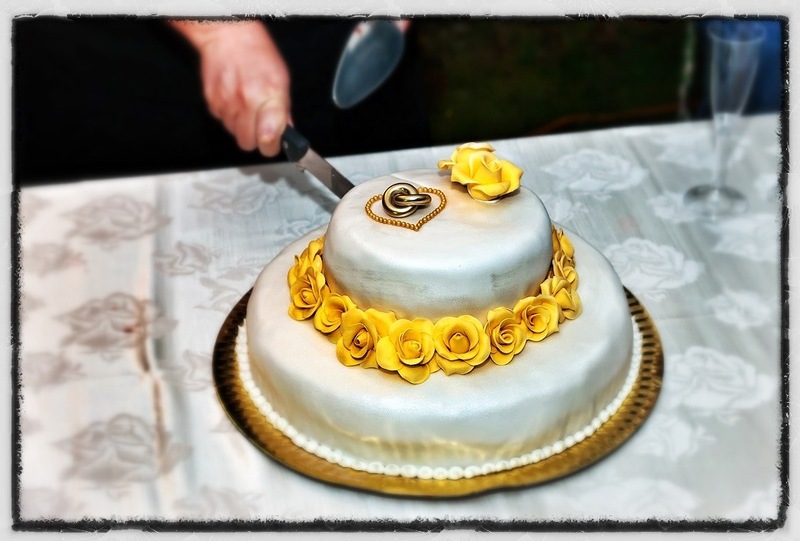 Before cutting up the cake, you have to disassemble the tiers and remove any flowers or other decorations. The easiest way to remove the top and middle tiers is to slide a thin metal spatula underneath the cardboard round supporting the tier; remove each tier one at a time. Gently tilt the tier up until you can slip your hand underneath. 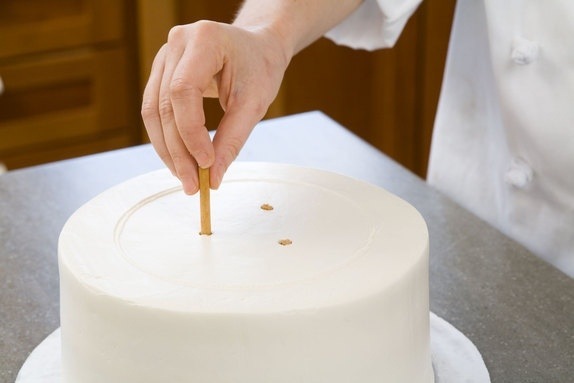 To remove the dowels from the bottom and middle tiers, use a clean pair of tweezers or pliers to carefully pull the dowels out of the cake.